An erratum to this article can be found at http://dx.doi.org/10.1007/s40264-014-0172-9. An analysis of 4,401 of these ‘posts with resemblance to adverse events’ (‘Proto-AEs’) from Twitter found concordance with consumer-reported FDA Adverse Event Reporting System reports at the System Organ Class level. At the same time that there is significant under-reporting of AEs through official channels, new Internet services have given voice to patients who routinely share information in public forums, including their experiences with medical products. Approximately 25 % of Facebook  profiles and 90 % of Twitter  feeds are fully public, and a broad range of health-focused forums support public discussions. Previous studies have suggested the potential of high-quality data generated by online social networks at low cost [11, 12, 13]. Even users’ search engine query histories have also been used to identify AEs . Many users also report AEs publicly, often expecting that someone is paying attention, as evidenced by hashtags for regulatory agencies (e.g., #FDA), manufacturers (#Pfizer, #GSK), and specific products (#accutaneprobz, @EssureProblems). (The hashtag [e.g., #accutaneprobz] placed in the body of a post is a way to categorize or tag the post to allow for quick retrieval via subsequent searching, similar conceptually to an email folder; the ‘at’ sign [@] placed in front of a Twitter username constitutes a ‘mention’, directing the message to the username in question, similar conceptually to an email address.) However, these data have not yet been used for routine safety surveillance and careful consideration must be given to how to process the information. Twitter data were collected from 1 November 2012 through 31 May 2013, and consisted of public posts acquired through the general-use streaming application programming interface (API). We chose this data source because it contains a large volume of publicly available posts about medical products. Data were stored in databases using Amazon Web Services (AWS) cloud services. Since the vast majority of the over 400 million daily Twitter posts have no relevance to AE reporting, we created a list of medical product names and used them as search term inputs to the Twitter API. Though this approach may remove posts that contain misspellings, slang terms, and other oblique references, it allowed us to start from a manageable data corpus. In order to avoid confusion with regulatory definitions of an ‘adverse event’ report, the term ‘Proto-AE’ was coined to signify ‘posts with resemblance to AEs’, designating posts containing discussion of AEs identified in social media sources. The labeled subset was chosen through a combination of review of the data in sequence as collected from the API for convenient time periods, as well as by searching the unlabeled data for specific product names and symptom terms. In conjunction with the FDA, a priori selected 23 prescription and over-the-counter drug products in diverse therapeutic areas were selected for quantitative analysis, representing new and old medicines, as well as widely used products and more specialized ones: acetaminophen, adalimumab, alprazolam, citalopram, duloxetine, gabapentin, ibuprofen, isotretinoin, lamotrigine, levonorgestrel, metformin, methotrexate, naproxen, oxycodone, paroxetine, prednisone, pregabalin, sertraline, tramadol, varenicline, venlafaxine, warfarin, and zolpidem. We also selected vaccines for influenza, human papillomavirus (HPV), hepatitis B, and the combined tetanus/diphtheria/pertussis (Tdap) vaccine. Whenever possible, we identified brand and generic names for each product using the DailyMed site from the National Library of Medicine and the FDA’s Orange Book. We created a curation tool for reviewing and labeling posts. Two trained raters (CCF, CMM) classified a convenience sample of 61,402 posts. Discrepancies between raters were adjudicated by three of the authors (CCF, CMM, ND). Agreement on overlapped subsets increased from 97.9 to 98.4 % (Cohen’s kappa: 0.97) over successive rounds of iterative protocol development and classification. The convenience sample was selected as a training dataset for further development of an automated Bayesian classifier, but the classifier was not used in the analysis presented in this study. The sample was enriched to include posts that contained AEs based on preliminary data review. Further natural language processing was required to identify the event in each post. Starting with the subset of posts identified to contain AEs, we developed a dictionary to convert Internet vernacular to a standardized regulatory dictionary, namely Medical Dictionary for Regulatory Activities (MedDRA®) version 16 in English. MedDRA®, the Medical Dictionary for Regulatory Activities, terminology is the international medical terminology developed under the auspices of the International Conference on Harmonization of Technical Requirements for Registration of Pharmaceuticals for Human Use (ICH). MedDRA® trademark is owned by the International Federation of Pharmaceutical Manufacturers and Associations (IFPMA) on behalf of ICH. The ontology matches Internet vernacular to the closest relevant MedDRA preferred term, but allows for less specific higher-level terms to be used when not enough detail is available for matching to a preferred term. The empirically derived dictionary currently contains over 4,800 terms spread across 257 symptom categories. For example, the post “So much for me going to sleep at 12. I am wide awake thanks prednisone and albuterol” (30 Sep 2013), would be coded to the MedDRA preferred term ‘insomnia’, by identifying ‘wide awake’ as the outcome, and both prednisone and albuterol as the drugs involved. Multiple vernacular phrases could be mapped to the same MedDRA preferred term, such as ‘can’t sleep’ and ‘tossing and turning’ in the previous example. As noted above and detailed in Freifeld et al. , we used a tree-based text-matching algorithm to match the raw text from the posts to the vernacular dictionary. Preferred terms were aggregated up to the System Organ Class (SOC), the broadest hierarchical category in MedDRA. The resulting dataset contained a high volume of irrelevant information, but provided a useful starting point. Over the period from 1 November 2012 through 31 May 2013, we collected a total of 6.9 million Twitter posts (‘tweets’). Of these, we manually categorized 61,401 as Proto-AEs (4,401) or not (57,000). While the number of Proto-AEs represented 7.2 % of the 61,402 posts analyzed, we reiterate that this was a convenience sample enriched for Proto-AEs and should not be interpreted as the prevalence of AE-related reports in social media. There were 1,400 AEs reported to FAERS from 1 October 2012 through 31 March 2013 for the 23 active ingredients analyzed. Exactly 1,400 events were reported by consumers to the FDA during the two quarters for the products of interest, corresponding to 1,478 unique drug–event pairs. For 59.4 % of events, the drugs were primary suspect agents; 33.1 % were concomitant, and 7.5 % secondary suspect agents. We analyzed data for four common types of vaccines: influenza, HPV, Tdap, and hepatitis B. Posts with AEs mentioned in Twitter (posts 460, AEs 634, some posts contained multiple AEs) were similar across vaccines. Most vaccine AEs were associated with influenza vaccines (posts 398, AEs 557), in part because ‘flu shot’ was a search term, whereas other vaccines did not have a corresponding vernacular. The imbalance may also be due to the differences in Twitter use among the populations receiving this vaccine versus others, given that it is an annual vaccine indicated for nearly all individuals aged over 6 months. Other vaccines had many fewer events, as shown in Table 1. The most common AE by preferred term was injection site pain, followed by pain, urticaria, and malaise. The recently passed FDA Safety and Innovation Act (FDASIA) legislation (2012) and the FDA-issued report Advancing Regulatory Science at FDA: A Strategic Plan (2011) have emphasized the importance of post-market safety surveillance and called for identification of new sources of post-market safety data. 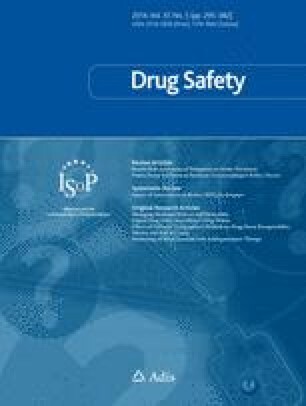 Accordingly, this analysis was intended to evaluate the potential value of burgeoning user-generated social media data in post-market safety surveillance of drugs and biologics. One of the key aspects of this research was to develop an ontology that allowed translation between social media vernacular and MedDRA, yielding strong automated classification performance as noted above. As an illustrative example of this cross-ontology translation process, we consider the tweet “Humira never really worked for me. Orencia was good. Xeljanz was the best but ate a hole in my stomach. #RABlows.” In this example with rheumatoid arthritis medicines, the first product could be reported as ineffective, but there is also a more serious event. The last product mentioned what could be an exaggeration: “ate a hole in my stomach.” However, the medication guide for this product states “XELJANZ may cause serious side effects including: tears (perforation) in the stomach or intestines.”  The example illustrates that context is required to interpret the findings, a task that humans inherently perform better than machines. Initially, identifying that a “hole in the stomach” could be a serious event required previous knowledge of the labeled side effects . We would likely have been less concerned if the post seemed to be complaining about routine gastrointestinal (GI) discomfort after taking aspirin. As such, we believe that this is a task for which humans are, for the time being, best suited. Advanced methods to apply label information may alleviate this particular issue, but we found that a human curation step, after the machine classified the posts, was the most efficient way to understand the nature of the problems reported. Another illustrative example is paresthesia, often referred to as ‘brain zaps’ or ‘head zaps’. These events have been reported for rapid discontinuation of serotonergic antidepressants as a class . We found ample evidence of the relatively new medicine vilazodone (marketed as Viibryd) from patients: “Second day off Effexor & on Viibryd here. Brain zaps are fun. And by fun, I mean horrendous and miserable.” Also: “Viibryd side effects—I’m having the awful head zaps too. They are mostly @ night when I’m laying down … .” The US prescribing information in the label states that “paresthesia, such as electric shock sensations” have been reported for the class of antidepressants, but during clinical trials only two patients in the treatment arm and one patient on placebo experienced these sensations . While this association is not particularly unexpected, it demonstrates again how knowledge of the label can help put findings from the Internet in context and begins to suggest the rapidity with which information can begin to flow back to the public authorities and manufacturers if social media data are cleaned and curated in a thoughtful manner. In addition to patients, clinicians may use Twitter to communicate about cases that may involve AEs. For example, the following post was made from the account of an internal medicine resident at a hospital in the USA: “PMHx includes DVT x2 on xaerlto [sic], recurrent tonsillitis, former smoker, denies EtOH, denies surgeries, is married.” The drug Xarelto (rivaroxaban) is indicated for deep vein thrombosis, but it is unclear if the recurrent tonsillitis is associated with the medicine. The US labeling suggests increased incidence of sinusitis in one clinical trial relative to placebo , and a post hoc analysis of a phase III randomized trial found increased incidence of respiratory tract or lung infections among participants with higher body mass index (BMI) relative to comparator (enoxaparin) . Without emphasizing the particular drug–event pair, we provide this example to show how information from label studies, peer-reviewed research, and regulatory databases can be used in conjunction with social media to generate hypotheses for further testing. While it may be feasible to review all social media posts with Proto-AEs for lower volume drugs, there is likely to be a point at which the volume of posts, say for a widely used and established medicine, may overwhelm the capacity for human review, requiring further automated analysis. We also stress that, at this time, we do not recommend the wholesale import of individual social media posts into post-marketing safety databases. Rather, in parallel with other post-marketing sources, these data should be considered for idea generation, and reasonable hypotheses followed up with formal epidemiologic studies. Not all patients reporting side effects on Twitter are capable of identifying them correctly, as seen in this example: “I got the flu shot yet somehow I’ve gotten the stomach flu twice in this month” where the vernacular “stomach flu” would need to be translated into a medical term, and the report was excluded from analysis because the reported ineffectiveness does not correspond to an indication or common off-label use for the vaccine. Other errors may be inadvertent, but also need to be reviewed by curators: “The act of kissing releases OxyContin in the brain—a hormone that strengthens the emotional bond between two people.” In this case, the likely intended reference was to oxytocin, but this post is not characterized as a Proto-AE because it did not include an adverse reaction. Additional work will include the development of denominator-based pharmacoepidemiological methods to establish baseline and threshold levels of signal for each medical product such that when social media signals deviate from these ‘norms’, users can be passively notified of potential new safety signals. For now, this platform is viewed as a hypothesis-generating system where potential signal would be validated against more formal methods, but it could potentially become a more confirmatory resource as our methods and validation are refined. Levinson D. Hospital incident reporting systems do not capture most patient harm (OEI-06-09-00091) 01-05-2012 [Internet]. Cited 17 Oct 2013. http://oig.hhs.gov/oei/reports/oei-06-09-00091.pdf. 52 Cool Facts About Social Media—2012 Edition #socialmedia—Danny Brown [Internet]. dannybrown.me. Cited 25 Nov 2013. http://dannybrown.me/2012/06/06/52-cool-facts-social-media-2012/. An exhaustive study of twitter users across the world—social media analytics beevolve [Internet]. temp.beevolve.com. Cited 25 Nov 2013. http://temp.beevolve.com/twitter-statistics/#c1. CDC-VAERS-vaccine safety [Internet]. cdc.gov. Cited 25 Nov 2013. http://www.cdc.gov/vaccinesafety/Activities/vaers.html. Pfizer. XELJANZ-tofacitinib citrate tablet, film coated [Internet]. labeling.pfizer.com. Cited 18 Oct 2013. http://labeling.pfizer.com/ShowLabeling.aspx?id=959&section=MedGuide. dailymed.nlm.nih.gov [Internet]. Cited 18 Oct 2013. http://dailymed.nlm.nih.gov. Viibryd US prescribing information [Internet]. Cited 12 March 2014. http://dailymed.nlm.nih.gov/dailymed/lookup.cfm?setid=4c55ccfb-c4cf-11df-851a-0800200c9a66. Xarelto (Rivaroxaban) tablet, film coated [Janssen Pharmaceuticals, Inc.] [Internet]. dailymed.nlm.nih.gov. Cited 18 Oct 2013. http://dailymed.nlm.nih.gov/dailymed/lookup.cfm?setid=10db92f9-2300-4a80-836b-673e1ae91610#nlm34084-4.